The Scientific Study of Marihuana is an . . .
". . . important collection of research papers (some of them Abel's own) on the psychological, physiological, and social effects of marijuana. . . . A charming essay by Baudelaire introduces the collection. . . . fascinating reading." "Material which otherwise is rather widely scattered, has been brought together in a readable and informative way. . . . The book would be very useful for general reading for one who wants to be informed about the ancillary aspects; the enlightened layman may derive much value in reading the book."
. . . a good overview of the subject." Dr. Ernest Lawrence Abel is a noted research scientist who has been active in the study of drugs. 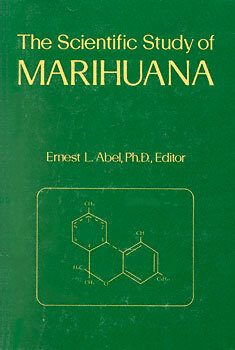 He has participated in many of the experiments on the effects of marihuana use described in this book. A Canadian, he attended the University of Toronto from which he received his bachelor's, master's and doctoral degrees. He has also bee a post doctoral fellow at the School of Medicine of the University of North Carolina in Chapel Hill. His previous published works include Drugs and Behavior, published in 1974, Ancient Views on the Origins of Life, and The Roots of Antisemitism. He has contributed articles to Science, Nature, British Journal of Pharmacology, CIBA Symposium, Journal of Comparative and Physiological Psychology. Dr. Abel is a member of the New York Academy of Science, the American Society for Experimental Pharmacology and Therapeutics, and the American Psychological Association.